This article appears in the Spring/Winter 2019 issue of Troon Magazine. Click the image above to view. The back nine of the Greg Norman designed course might just have the best seaside holes this side of Pebble Beach. Starting with the short par-3 No. 11, six consecutive holes hug the rocky shoreline on a scenic peninsula, offering many meditative moments to gaze off into the reef-filled waters below. You're so close to the Caribbean on the back tee of the 303 yard 14th that you can feel the mist from the crashing waves and hunt for sea shells on the tee box after your drive up over the hill. The front nine, which winds around sandy waste areas, lakes, and native vegetation, might be better from a pure shot making and design standpoint. Memorable holes include the short par-4 fourth, which requires a 170-yard carry over a lagoon to reach the fairway, and the 165-yard sixth with its island green. You've got to love an island green on an island in a nation that is nothing but islands. There's also a lot to appreciate about the all-inclusive resort itself (multiple free rounds are included with a weeklong stay). Located along a mile of white sand on a turquoise cove, the 249-room hotel has 11 restaurants, a giant pool with a swim-up bar and an impressive fire pit in the middle that lights up at night, and a host of other activities like daily scuba diving for certified divers from its 150-slip deepwater marina. Guests also enjoy a 16,000-square-foot spa, all kinds of watersports to try in the cove, tennis, croquet, and a lot more. And, with direct flights from Toronto, Atlanta, Charlotte, Ft. Lauderdale, and Miami (as well as Nassau), getting to Great Exuma has never been easier. Just don't forget your clubs. 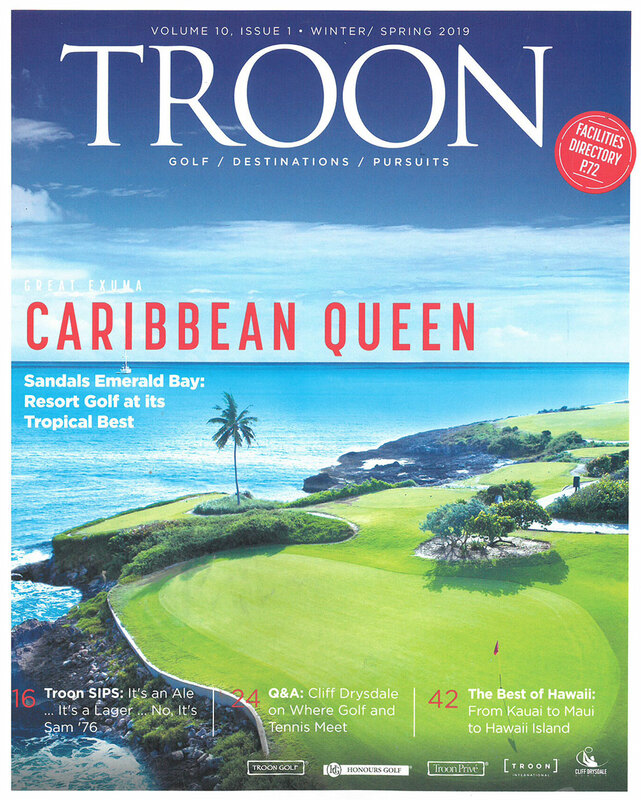 This article appears in the Spring/Winter 2019 issue of Troon Magazine.